The global structural health monitoring market consists of several prominent players who are on the lookout for a greater market share as against their competitors. This quest for growth has intensified the competition within the market, and the moves of a single player are expected to invite a strategic business response from all other key players. The global market for structural health monitoring endows tremendous growth opportunities for the market because of the development of the healthcare industry. The market players are cautious about optimizing these opportunities available at their disposal to widen their profit margins. Furthermore, the leading market players are expected to concentrate on product development to prove their supremacy in the domain of structural health monitoring systems. 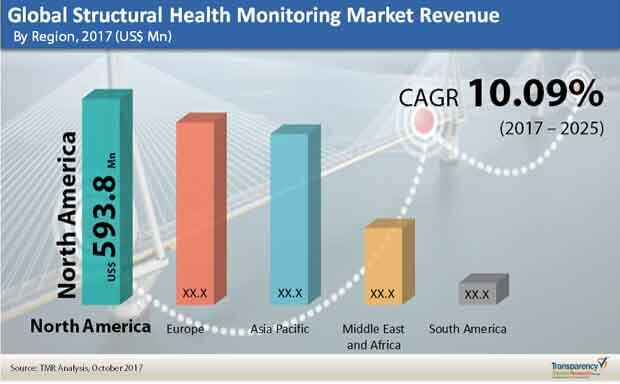 Expanding the geographical reach is also projected to be a key strategy on the minds of the market players that currently exist in the global market for structural health monitoring. The local and regional players are expected to rely on forming strategic alliances in order to sustain themselves in the market. Lack of technological expertise acts a barrier to the entry of new players and sustenance of inexperienced ones. Some of the leading players in the global market for structural health monitoring are Kinemetrics, COWI A/S, Wiss, Digitexx Data Systems, Inc., CTL Group, OSMOS Group, Elstner Associates, Inc., Janney, National Instruments Corporation, Nova Metrix LLC, First Sensor, ACELLENT TECHNOLOGIES, INC., and ATKINS. A report by Transparency Market Research (TMR) forecasts the growth pattern of the global market for structural health monitoring over the period between 2017 and 2025. The report finds that the global market was valued at US$1.57 mn in 2016 and is projected to touch a value of US$4.09 mn by 2025-end. Furthermore, the CAGR of the global market over the aforementioned forecast period is expected to be 10.09%. The current pace of urbanization has surpassed all the previous records, and this has given a boost to the global constructions industry. The demand for strong and reliable infrastructure has become a necessity for the industrial, residential, and commercial sectors. Hence, the demand within the global market for structural health monitoring has escalated to new heights in recent times. Moreover, development of town centers and industrial zones in the emerging economies has also played to the advantage of the global market. The real estate industry has undergone fundamental changes that have necessitated the deployment of structural health monitoring systems across all forms of infrastructure. Hence, the growth of the global market for structural health monitoring is expected to hinge on a number of current-day advancements in the constructions industry. Governments across the globe have been making concerted efforts to effectuate safer standards in the constructions industry of their respective regions. This has been an important driver of demand within the global market for structural health monitoring and has also aided the growth of the market players. Furthermore, the protection of historic monuments and heritage structures to enhance the tourism industry has also given a push to the demand within the global market.